October is always a busy month! 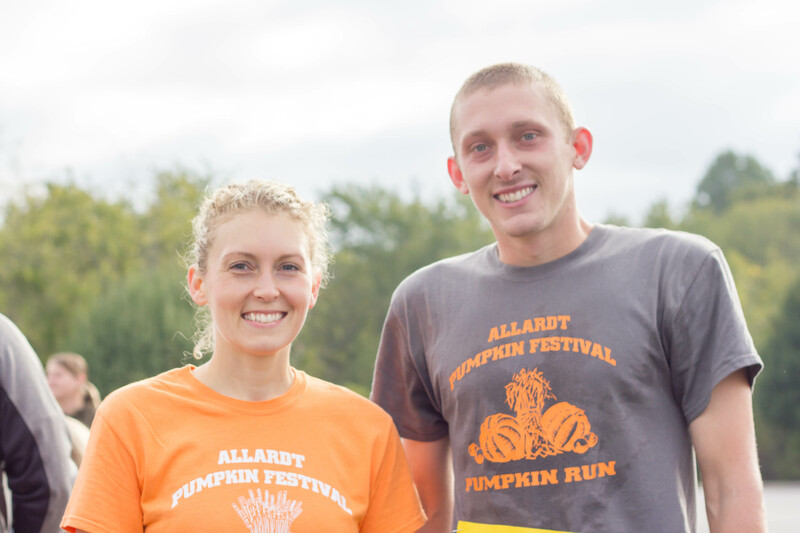 The first weekend, I ran the Pumpkin Run 5K with my family. 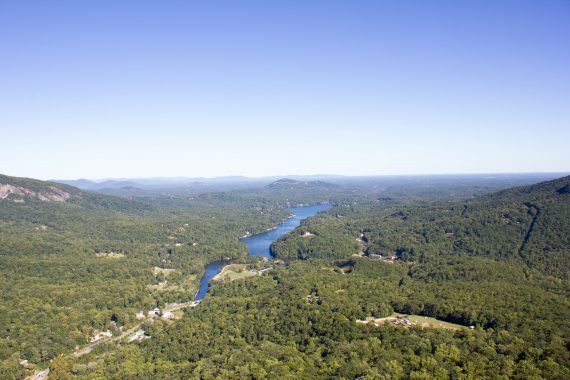 After training for the Big South Fork 17.5 Mile Trail Race (more about that here) and marathon in December (whoa! so soon! =/ ), it was nice to take a week to run some shorter runs. 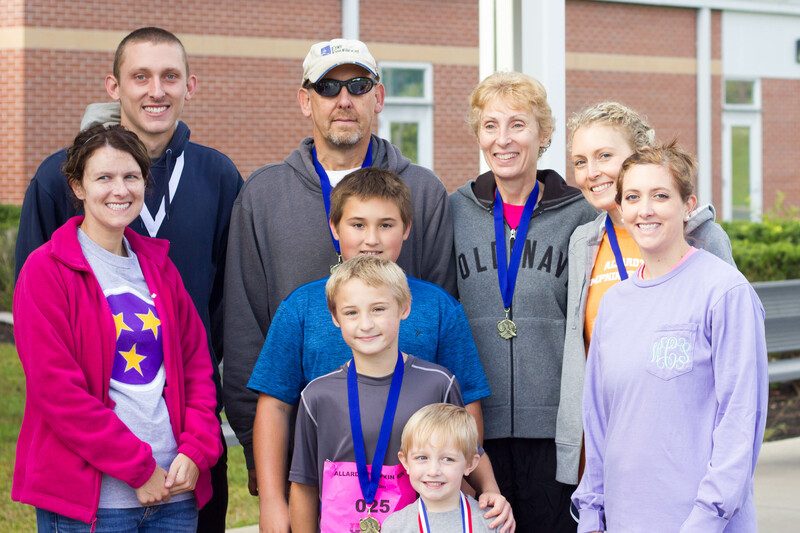 The weather was perfect, we all had some of our best times, and we all placed/won our age group! Here’s a picture of the whole group: me, my parents, brother, his girlfriend, and my cousins. This cutie didn’t win the Pumpkin Run, but she did win Most Photogenic at the Pumpkin Pageant. 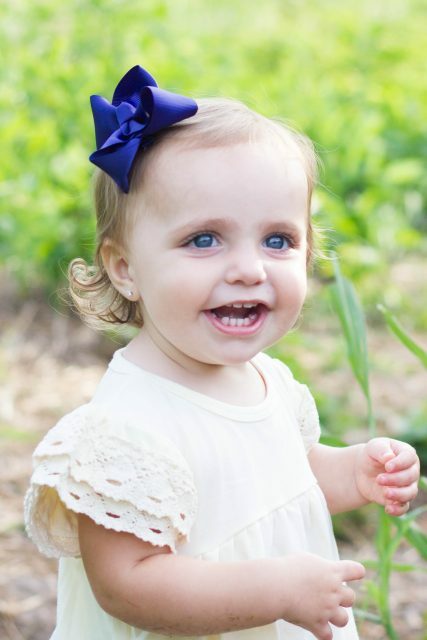 Of course, she had a great photographer (–> me) ;). I’ve still been crafting! I made these pumpkins out of pieces of 2×4. 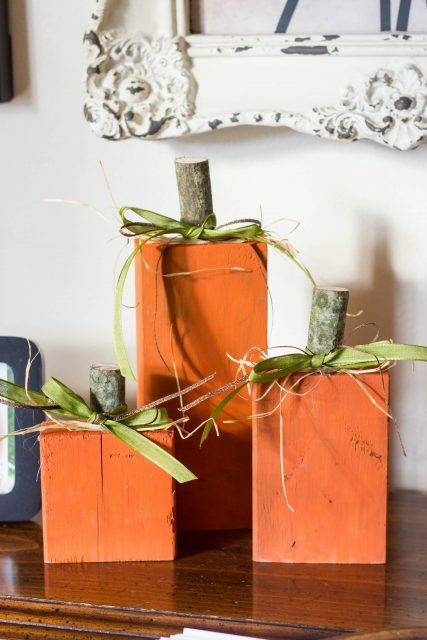 I painted them orange, hot glued a branch on top for a “stem”, and tied a ribbon around the branch. They couldn’t have been easier and I thought they turned out pretty cute! My next project was this wreath. I took a piece of wood, stained it, painted “thankful” in white, and put a light coat of varnish over top. 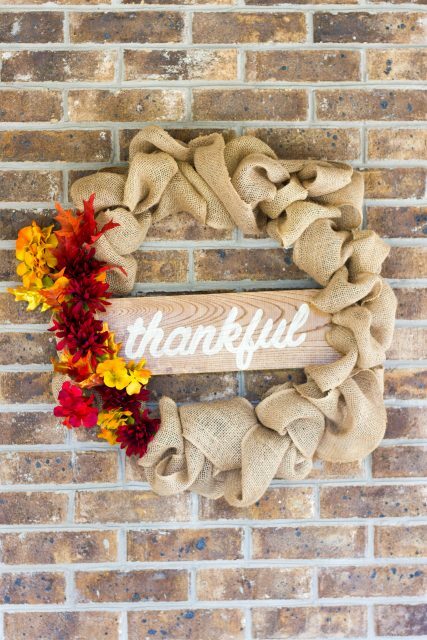 Then I attached it to a wire wreath, stuffed the wreath with burlap, and hot glued/wired some fall colored flowers on one side. Again, another easy (and cheap) project! My parents were off from work for fall break, so we headed to Virginia and North Carolina for a long weekend. Our first stop, was Abingdon, VA to ride the Virginia Creeper Trail on bicycles. 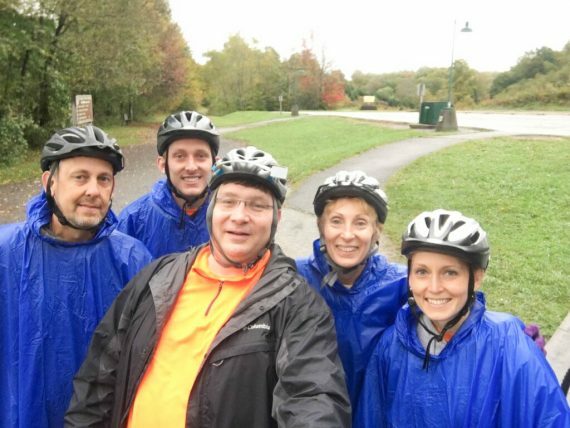 This was our second time riding the trail (1st time was in June 2016), and while it was lightly raining at the start (thus the ponchos! ), we actually had pretty descent weather. The rain completely stopped after about an hour, and we had the trail to ourselves for at least the first 17 miles =). We took a shuttle to Whitetop and then rode back to our car in Abingdon (~34-35 miles total). If you enjoying biking, highly recommend this trail! So much fun! Our next stop was Mount Airy, NC, also known as Mayberry, NC because it was Andy Griffith’s hometown. This is also where Eng and Chang Bunker are buried, which was way more exciting than Andy Griffith for me since 5th grade Kendra was obsessed with Siamese twins. 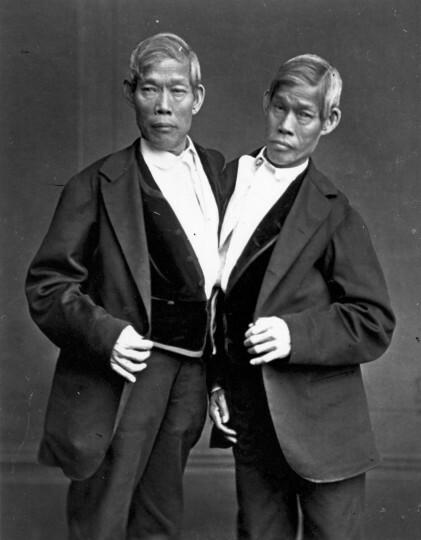 In case you weren’t ever fascinated by Siamese twins, Eng and Chang Bunker were the brothers (from Siam) whose condition and birthplace became the basis for “Siamese Twins”. After Mt. Airy, we headed to Grandfather Mountain to visit the mile high swinging bridge. 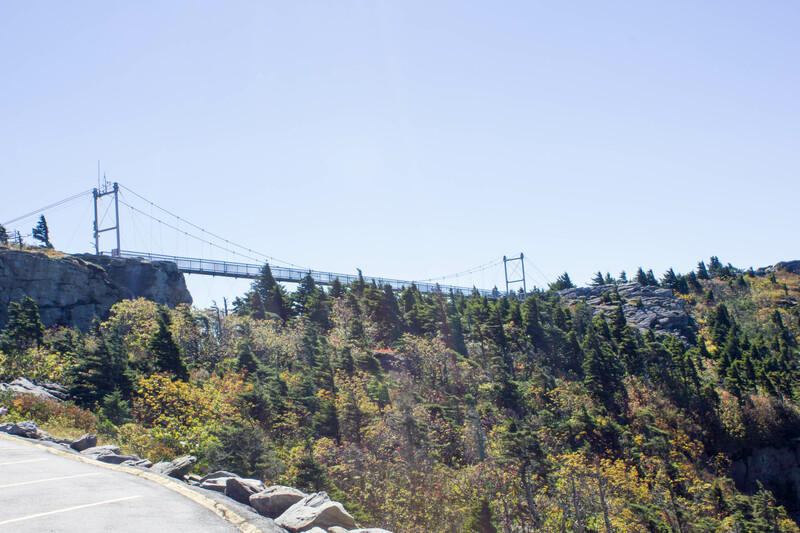 Grandfather Mountain is one of the highest peaks in the Blue Ridge Mountains and the bridge supposedly gives amazing views. Unfortunately, there was 60 mph winds when we got to the top and they weren’t letting people go out on the bridge. Bummer! But considering I could barely stand to get a picture (no joke, the wind was incredibly strong! ), I think they probably had my safety in mind. Even without walking on the bridge, the view from the top is still amazing. Maybe someday I’ll go back when it’s not quite as windy though =). 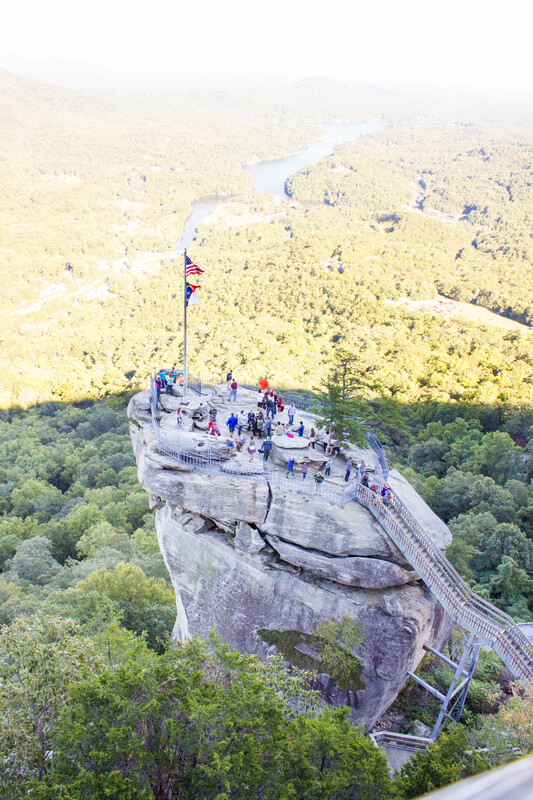 Later the same day, we headed to Chimney Rock, which is exactly what it sounds like – a big rock with more great views! Be prepared to do some climbing – almost 2000 steps to the highest view point! 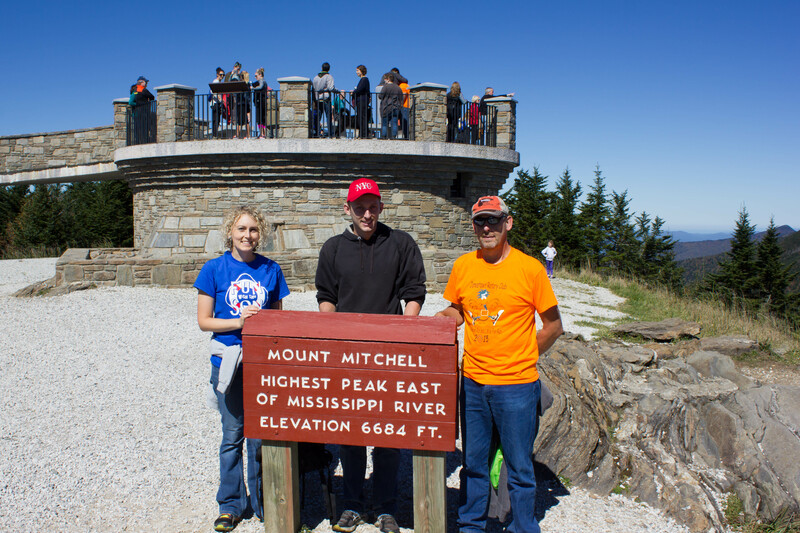 The next day, we hiked to the top of Mount Mitchell, the highest peak east of the Mississippi River. When they said “strenuous 4 mile hike”, they meant strenuous! I thought they meant strenuous because of the elevation increase, but they didn’t mention that the trail was super rough and there was rock climbing involved….or maybe I just missed that part?? Either way, we made it and it was still fun! 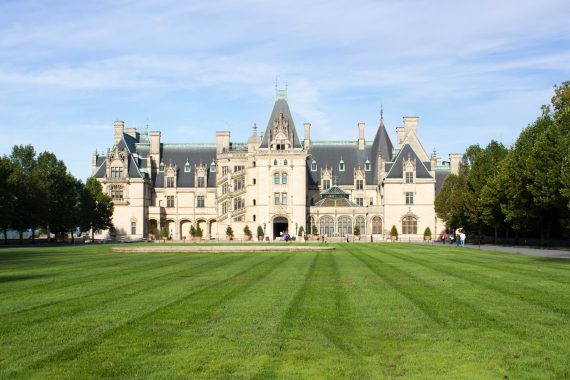 We ended our trip with a visit to Biltmore. It had been about 15 years since any of us had been there and it was just as impressive this time as all the previous times! We got there as soon as it opened, and there were no lines. We got our tickets and walked right it, however by the time we were leaving the line of people waiting to enter was backed up from the entrance (middle of the picture) all the way down the road to the right here in the picture (and beyond!). Best advice: get there EARLY! 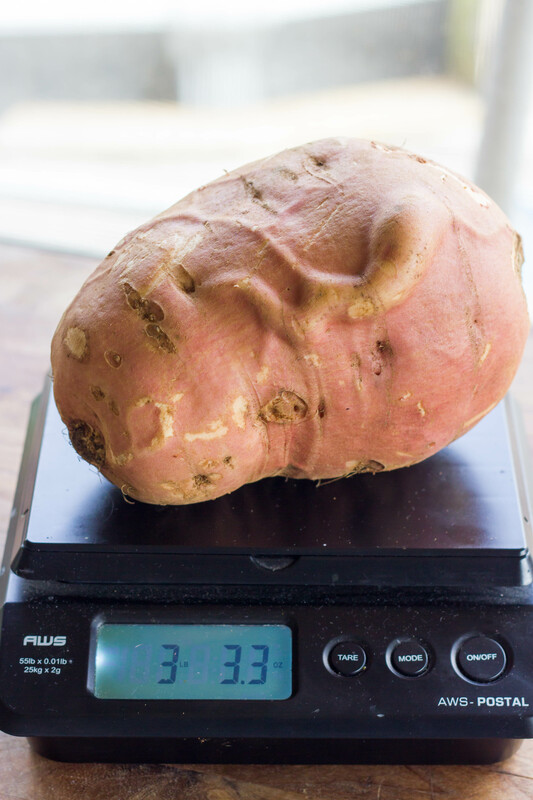 Look at this massive sweet potato my dad grew – 3 pounds 3.3 ounces!! Remember that test I spent the entire summer studying for? I PASSED! 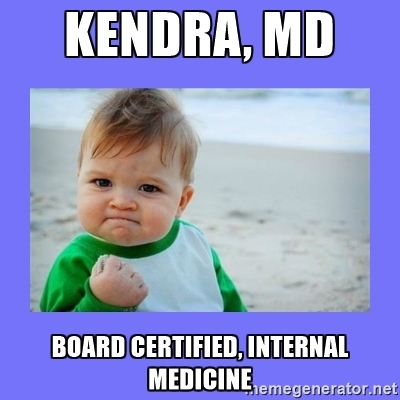 I’m officially a board certified internist now! 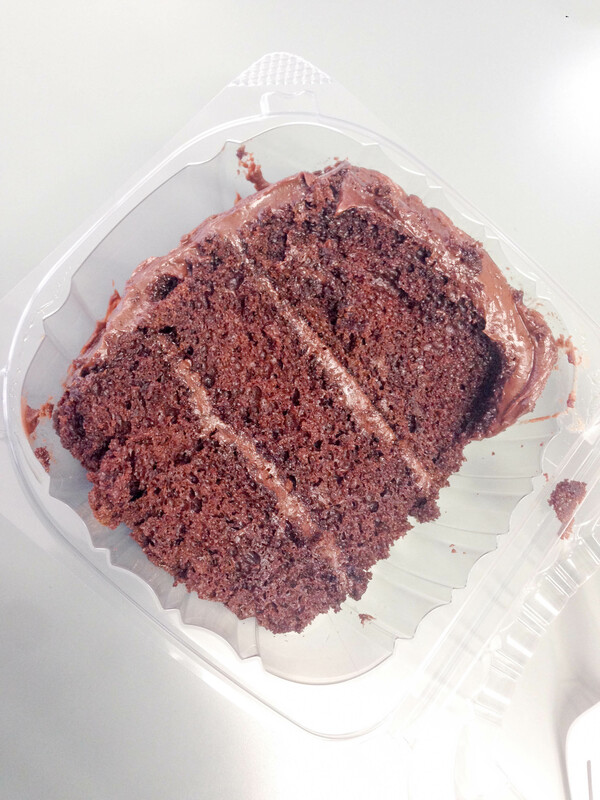 No more (big) tests for 10 years! Woo hoo! Follow me on Instagram and Snapchat (@kendrastreats) for more “real-life” photos!